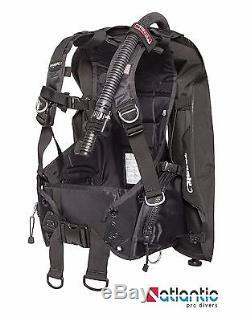 Zeagle Scout BCD - Medium. Serving The Southeast Since 1965. The Scout represents an exceptional value in a lightweight system. It has a low profile single bladder with an elastic retractor, and an elastic waist closure. Although lightweight Zeagle has not skimped on durability, manufactured from 1000 Denier Nylon making this a BC you will get years of service from. Two zippered utility pockets for gloves, lights and other accessories, adjustable sternum strap, for a more comfortable and custom like fit. Attachment of accessories is made easy with the two stainless steel D-Rings on the vest and two more on the shoulders. With this durable design you also get Zeagle's time proven durable and rugged Bx Power Inflator System. The weight system consists of two rear mounted pockets with a touch fastener release and a 20-LB maximum total weight capacity. The Scout is Zeagle's lightest and most compact BC, and is ideal or a basic travel system with minimum weight and bulk. The Scout does not use the Personal Fit System Vest Measure Waist Size Shoulder Measure Shoulder to Waist. The Scout does not use the Personal Fit System. Shoulder Measure Shoulder to Waist. FeedBack We always return feedback once we receive you feedback. We have been in the business of scuba for over 50 years and we were not here to wrong or defraud anyone. Any product you return must be in the same EXACT UNUSED condition you received it and in the original packaging. However for any reason should you NOT be happy please let us know and we WILL make things right. We will make sure that YOU win in the rare event that we do make a mistake. Founded in 1965 Atlantic PRO Divers are North Floridas Oldest and Largest PADI 5 Star Dive Center located at Jacksonville Beach, Florida. APD offers only the BEST of everything scuba to our customers. Serving The Southeast Since 1965 Zeagle Scout BCD SIZE: MEDIUM The Scout represents an exceptional value in a lightweight system. The Scout does not use the Personal Fit System Vest Measure Waist Size Shoulder Measure Shoulder to Waist The Scout does not use the Personal Fit System Vest Measure Waist Size Shoulder Measure Shoulder to Waist SM 28"-35" SM 14"-18" MD 33"-41" MD 18"-22" LG 37"-45" LG 22"-26" XL 42"-50" XL 26"-29" FeedBack We always return feedback once we receive you feedback. The item "Zeagle Scout BCD Medium" is in sale since Saturday, March 10, 2018. This item is in the category "Sporting Goods\Water Sports\SCUBA & Snorkeling\Buoyancy Compensators". The seller is "atlanticprodivers" and is located in Jacksonville Beach, Florida. This item can be shipped to United States, all countries in Europe, all countries in continental Asia, Canada, Mexico, Brazil, Australia, South africa, New Zealand, Chile, Colombia, Costa rica, Panama, Trinidad and tobago, Guatemala, Honduras, Jamaica, Bahamas.